Port Alexander is a thriving metropolis on the East coast of the United States of America. It is a thoroughly modern city with skyscrapers and the headquarters of many world-class corporations. It is a port city, with ships arriving and departing regularly to and from all points of the globe. The harbor is large and well-sheltered from storms. The James river is large, deep and swift. It is navigable for some fifty or sixty miles upriver, and barges can often be seen heading up and down the river. Midtown (Port Alexander on the map) Midtown is the business center of Port Alexander. Offices and corporate headquarters abound, as well as many of the city's major governmental and cultural institutions. The museum is three stories, the lowest being quite high, the second and third tall but more regular sized. Presumably there is a basement as well. There is one main entrance, a large columned gallery, and many windows. The windows are all alarmed and the lowest floor are also heavily barred. The second floor is where the travelling exhibits are usually lodged. There are many other exits, due to fire codes, and a couple of employee entrances round the back near the parking area. Likewise, loading facilities are in the back. Both areas are off- limits to the public. Shar-Chi, Importer, is located along the waterfront in an older section of Midtown. To the north of the James River (named after the explorer who found the harbor), is Old Town. 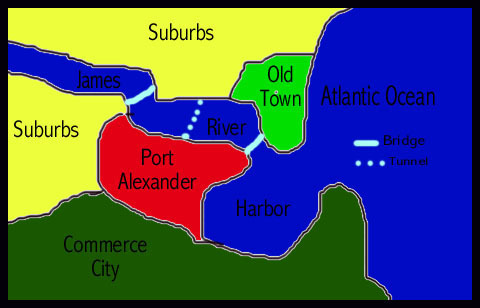 The separation between Old Town and new Port Alexander is substantially more than simply geographical. Old Town is where the rich and famous of Port Alexander live and play. Skyscrapers give way to stately mansions, and condos on golf courses. 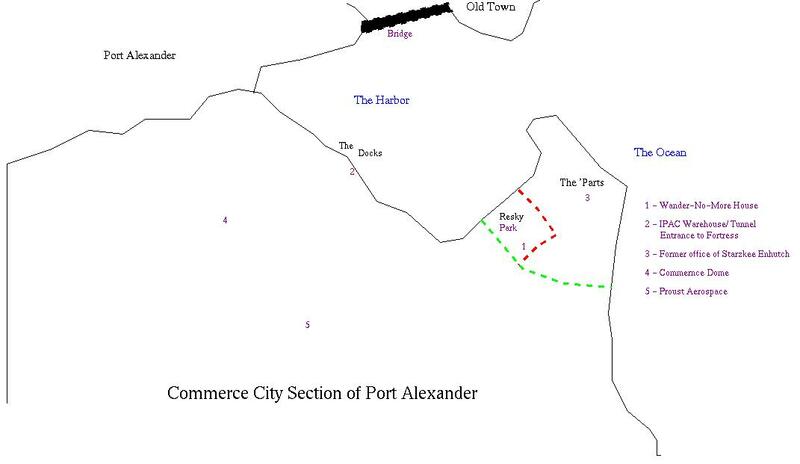 To the south of Port Alexander proper, and extending inland, is the industrial district -- Commerce City. Many heavy industries are located here, quite a few of which have their corporate offices in Midtown Port Alexander. On the point of the harbor, on the south side, in Commerce City is a ghetto area, the Ramparts, or 'Parts, named after the Revolutionary War era fort that once stood there guarding access to the harbor. The docks begin just West of the 'Parts, in the harbor proper. The 'Parts are often patrolled by Ka-Sador and Defender, while The Wanderer seems to concentrate somewhat on the docks. The CommerceDome, home to the Port Alexander Dutchmen, the city's professional football team. Reskey Park area, at the western edge of the ramparts, a transitional neighborhood on its way up. Centered on Reskey Park, a small park that was the gift of Russian expatriate Ivan Reskey who had great success in Port Alexander. Still home to a large Russian immigrant community. The Wander-no-More House is located here. The secret entrance to the tunnel to the Eagle's Nest is located under a building registed to the Quick Response Alarm Company, a front for an IPAC vehicle/equipment depot. Office of Starzkee Enhutch, in the 'Parts. The subway, the "PortRail", runs throughout Port Alexander, extends tentatively into the reaches of Old Town, races for some distance into Commerce City, and stretches some nine or ten miles inland (often connecting with "Park and Ride" stations, with large parking lots, where commuters can leave their cars and ride into the city proper.